Ciarán Malone was our most succesful athlete this year, winning a silver medal at the Community Games Finals. 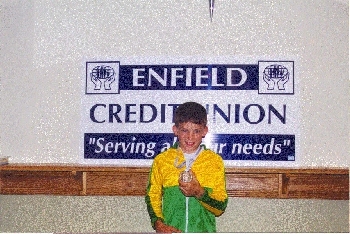 Ciaran won his heat of the Boy's U/10 100m in Enfield Community Games in May 1999. Ciaran came second in the final of the U/10 100m in Enfield therefore qualifying for the Meath Finals in Cushinstown. On September 4th. 1999, Ciaran was second in his heat of the U/10 100m in the National Finals and therefore he qualified for the semi-final on the following day 5th. September. The semi-finals were on the morning of the 5th. and Ciaran won his semi-final. The Final was held in the afternoon and Ciaran won silver in a very exciting race. During the summer Ciaran also won the All-Ireland N.A.C.A.I. Under 10 high Jump, he was third in the All-Ireland N.A.C.A.I. Under 10 Long Jump. He was also on the Meath Under 10 Relay team that won the All-Ireland club 4x50m Championship.